So I thought I would go ahead and make topic for people to tell us about what their avatar is, where they got, and/or why they use it. I guess I'll go first, my avatar is of a create-a-character I used in that old game Blinx 2 (if anyone remembers that game) and since I heard Microsoft has officially abandoned this franchise this year I thought might as well start using this character. Also this picture in particular is a drawing I commissioned from someone off of Tumblr. 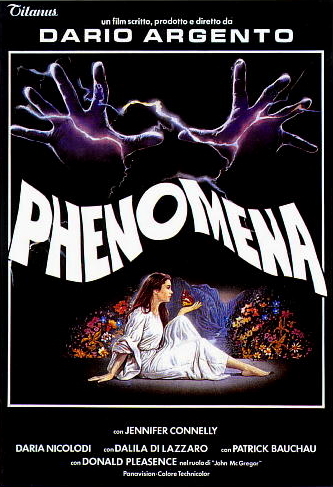 I chose the poster art for the Dario Argento film "Phenomena". I don't think it is for any other reason than I really like that film. 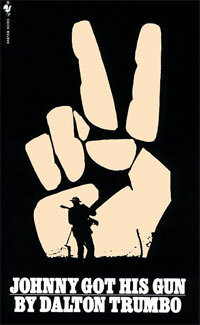 I used to have the cover art from the novel "Johnny Got His Gun" as my avatar. Kinda obvious where it's from. As for why? Well, it is the Housepets fan forum, and I like Fox. >_> Kinda wish I had a more meaningful reason, but it is what it is. 1) Squolth(squirrel + wolf + sloth): before I admitted to being a furry I decided that if I were to have a fursona, it would be a mix of a squirrel, a wolf, and a sloth. squirrel because I have ADHD and squirrels are kinda hyper, sloth cause I'm lazy, and wolf cause... I like dogs and wolves I guess? so for my first Species Change Week on the forums, I decided to become that hybrid, and got a drawing of it from Box'O'Lions (now ResTheRabbit). 2) Dog on Couch: at some point, dissension held a contest: give him pictures of your local emergency vehicles and get a chance to win a free copy of Ten Thousand Miles Up and a drawing by Rick at some point when his commissions open up. I won, and eventually a few years later, Rick's commissions opened up, and I got a black and white drawing of the main character of my fan fic, which was actually me in Anatolian Shepherd form. eventually, Douglas Collier offered to color it in, and he did so. 3)winged cat with knife: all of my forms have an optional set of dragon wings, cause flying is cool. also, I use a butcher knife as my weapon of choice cause it's fun. and for the Artistic gift exchange, I provided descriptions of a few of my forms, and whoever got my name chose which one to draw. CaptaiaPea chose my cat form. 4)winged wolf: CoatlRuu chose both my wolf form and human form, and I liked the wolf form better so I cropped that out to use as my avatar. 5)winged human: NickCole chose my human form. this one's actually still my skype avatar. 6) dog in sweater with coffee: last year Rick drew Christmas gifts for all the mods, so I got another drawing of my dog form, a bit closer to what I'd actually be like as a dog considering I wear glasses. It was black and white and again, Doug offered to color it and I said he could. 7) sleeping bat monkey: Vincent_Vontrap (warning, if you look him up not all his stuff is forum appropriate), a guy in my local furry group had a contest for naming his newest fursuit. in the video showing what it looked like worn, the model had a vest jacket like Dipper Pines from Gravity falls. so I googled for stars in the big dipper and came up with Polaris, which won. so I decided to get a drawing of my monkey form since it's one of my favorites and I didn't have one yet. Sabrina about to be chewed out by Tarot for messing with the past in the arc Housepets 5000 BC, part 3. Next to last strip where Sabrina wrote something back in 5000 BC which was just discovered. And you just know Tarot will give her a thorough breaking speech. I took the Max-Anti made by D-Rock and played with the color curve option in my phone. My previous avatar was Grape (with a gun) with Spaz's colors (Spaz is from Jazz JackRabbit 2). Also colored by D-Rock. I thought it was a darkly colored Grape at first because I couldn't see the ear bite. Red Mighty Morphin Power Ranger. It's funny, really. Dayzee called me "Rocky" on the Tails of Babylon thread, immediately followed by Buster referring to me as that, so I ran with a famous Rocky. I did at one point have the blue Zeo ranger as well, as both were powers held by Rocky in the series. Previous icons included my old DA avatar, to link myself, basically, followed by one of Poncho that was used here, then by recolors of various characters that I ended up liking. For Halloween, I used an edit of Bino, but with a slightly "Zalgo-fied" look, at least to the best of my abilities (even had my signature be scrambled), followed immediately by the Shadow face, also used in Tails of Babylon. My avatars these days are all my fursona in one way or another. I'm a terrible drawer so they're all commissions or gifts. Check my signature to see who did the latest avatar. I always give the artist credit there. Mine is my fursona, which Buster drew for me the night I first posted about it on these forums because she's amazing. Same here. But beause I'm at the character limit of the signature, you'll find the artist credit on my profile page. Yeah this thing happened and now it's my avatar and OC. I think I'll call it fluffy. Its so fluffy I'm gonna die! 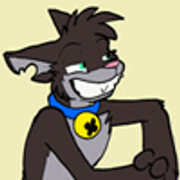 I've got three avatars since when I'm here, and all are cuts of Maxwell from the comic strips: the first one was this, used for few weeks; the second one is this (with Grape), used for some other weeks; now I'm using the third and current one since more than 1 year. Strange. I only remember you with your current avatar. Because the other ones where used a little time. I don't think I ever saw him use the over avatars either. My avatar is a rotation! It's a bunch of pictures various people have drawn of my fursona half of the time, and characters from the different webcomics I've read. It's kind of outdated though. But that's alright. How do you get it to rotate the avatars? we upload the pictures to randimg.net and use a link to the collection for our avatar. Maybe one of these days I will go do that. Yeah I remember you having those avatars. Something I said I would do if I ever got a hold of a Legacy Morpher. My avatar is a drawing of my first RP character from this forum, Lucky Richardson the Third, Esquire. So he's a rabbit lawyer? If he's lucky, does that mean his case win rate is high? Mine is the very first gift art I've received from NickCole, an ex-member of this forum. He was one of my first friends here, and we're still friends to this day. I changed my icons a few times, but I always go back to this one as a remembrance to the 2011-2012 era of this forum. No to both. He's not quite sure where Esquire comes from. As for his name, well, the universe appears to have a sense of irony. So he is unlucky then? Yep! He has a Luck stat of 2, the lowest a S.P.E.C.I.A.L stat can be. Is that why he's frowning in your avatar? Yep! He knows how bad his luck is and it makes him a worrywart. Commissioned a Christmas themed drawing and thought I'd go ahead make it my avatar, here's a link to it here. That avatar and the whole picture is actually very cute and I like how cartoony it looks! My first avatar here was drunk King for a while, then I went to a rotation of MLP stuff for like, a week or two just because I could. Then I decided to make the one I have now to be kinda different because who else is narcissistic unique enough to use their name as their avatar? For a long time it was just the blue one, but not TOO long ago I put it on a randomizer like Sleet so now, on occasion, a red one comes up instead. Huh. You know, I always thought it was some form of Eevee. Still waiting for what a Steel-type Eevee will look like. Trying something new for a bit. May change it back later. But for future reference (when this isn't the most recent comic), it's from here.